We deeply understand the final product, we will propose the best material exceeding the customer's ideal with a wide range of perspectives and flexible response capabilities. We will deeply understand the final product, we will propose the best material exceeding the customer's ideal with a wide range of perspectives and flexible response capabilities. Sales personnel with diverse knowledge and experience carefully hear customer's needs, carefully understand not only the physical properties of the material but also legal compliance and the shape of the final product, and propose the best answer together To do. For example, ISONO's great attraction is to be able to prepare flexible answer patterns such as "3 + 7" and "1 + 2 + 3 + 4" to derive "10". Taking advantage of a wide variety of information capabilities that do not limit the industry and products, treat a recycled material manufactured by our company and a virgin material of an external maker as a merchandise, overlooking the whole, and a multifaceted and multifaceted viewpoint We will further propose plus α to your needs. 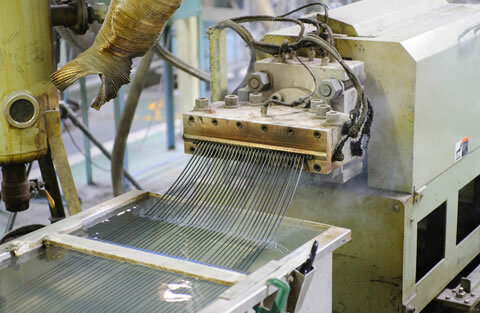 We are procuring raw materials as necessary and achieving stable supply of materials. Based on the quantity and quality of materials requested by customers, we prepare purchasing plans as necessary, procure resource plastics as raw materials by making full use of the network that we have built exclusively for recycled plastics for many years. moreover, we closely cooperate with own factory and a number of cooperating factories based in the whole country, we will actualize the supply of high quality and stable materials meeting customer's expectations. Ruder (extruder)It is a machine that extrudes resin melted by heat in a thread form. Then cut to a length of 2 to 3 mm to pellet. 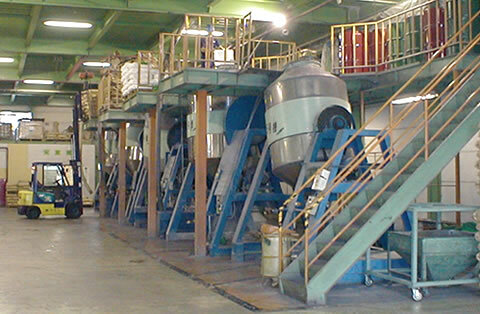 Tumbler mixer (mixer)It is a machine that uniformly mixes the same resins with different colors and uses. Storage tank with circulation function (silo)Circulate it to keep the pellet after cutting uniform. Grinding equipmentIt is a facility that crushes 1 meter square pallets etc. into about 7 mm flakes. 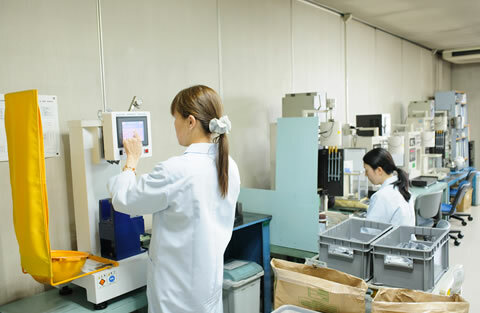 Test facilityWe have thorough facilities to check whether there is any problem in the quality, physical properties and specifications of the product against customer's requested quality. Excellent "Technical capabilities" as a pioneer handling recycled plastic since its founding. With 60 years of history and experience dealing with recycled plastics, it leads to four high technological strengths, making it possible to maintain innovative ISONO quality. Based on a rich database, about 150 kinds of pigments, about 30 kinds of additive (antistatic agent, anti-weather agent, etc.) are selected and combined, using ISONO's largest domestic tumbler, uniformly compounded with the material. ISONO's strength is that it not only replies with the same "10" for the "10" of the goal but also offers various combinations such as "3 + 7" and "1 + 2 + 3 +". We will continue to cooperate with our customers as many times as we carefully understand the requirements that the customer desires for the final product, consider the addition of necessary physical properties and functions from all angles, and reach the highest satisfactory answer. ISONO has realized a fulfilling quality control system based on data accumulated from years of experience and achievements. 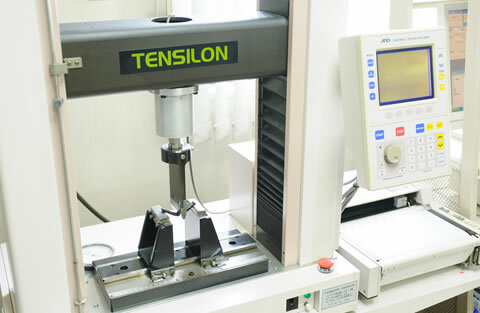 It is possible to measure the mechanical properties by using a measuring machine as well as checking by experienced personnel. Such a thorough quality control system is unique to ISONO. In addition, while accommodating the production of various types of recycled materials and plastic raw materials, we can also accept orders in small lots. Indeed, ISONO can be described as a quality control and inspection system by skilled skill and inspection. 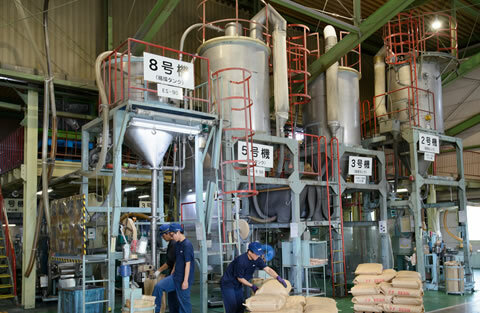 ISONO's recovery scheme realized through long-term nationwide dealings and networks throughout the country is an essential strength as a recycled plastic pioneer. As a leading company in the industry, it is a treasure that can not be replaced by anything in ISONO, as it is a social network that has been built up in earnest since its inception. 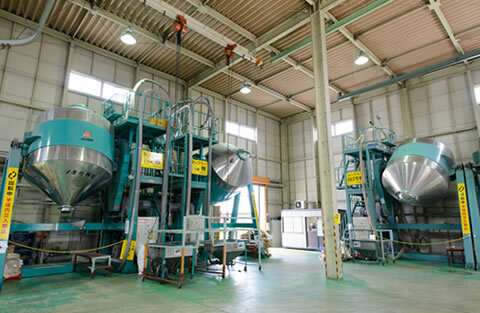 The procurement capacity is improved several times if there is a network spreading all over Japan, such as outsourcing companies and cooperative factories, although there is a limit to the securing of materials by the recovery of waste that can be said as lifeline of the recycling industry. The collection scheme is divided into open recycling and closed recycling. Open recycling is to create recycled materials with target physical properties. Closed recycling is to crush resource plastics occurring inside the company and add it as the same material or add value by compounding technology and return it to the originating company as another material. 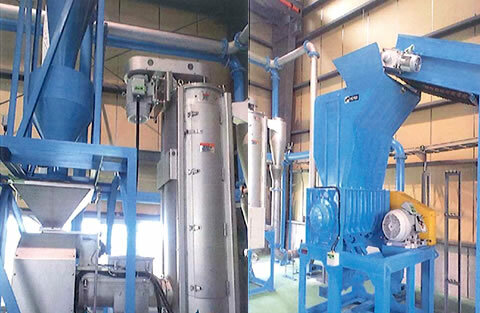 Demand for closed recycling is also increasing year by year, because there is no entry into and out of the outside, and it can be reused repeatedly while securing stable quality as resources. 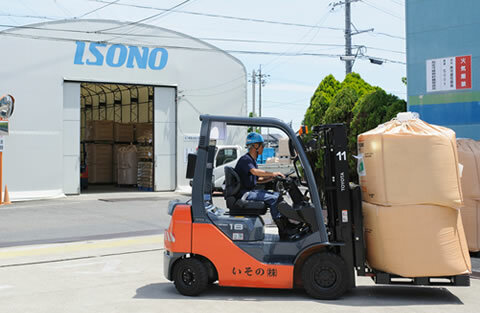 ISONO has a scheme to stably obtain raw materials in closed recycling from its own route.